In upright models, when the magnet, usually circular and surrounds the reed switch, is below or above the center of the reed switch, the contacts are opened. When the magnet is located at the center of the bulb, the contact is closed. 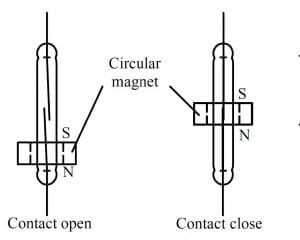 In horizontal models, a flat magnet (rectangular parallelepiped or disc) moves closer to the reed switch when the float turns on its axis when the magnet is close enough to the reed switch, the contact of the latter ‘s open. 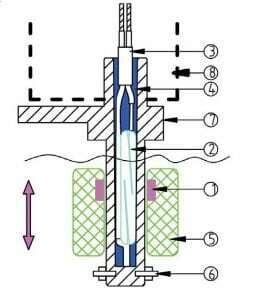 Selecting a magnet for a level switch application must take into account the characteristics of the liquid in which it will be immersed, of the temperature at which it will be subjected, of its corrosion resistance, of the magnetic field required to operate the switch and its distance to the reed switches. Sintered magnets are shock and vibration sensitive, “bonded” magnets have a low temperature resistance due to the resins used to agglomerate, and Neodymium –Iron-Boron magnets contain 60-75% iron (amount is dependent on grade) and are therefore prone to corrosion. Their price is extremely variable depending on the materials and manufacturing process, and therefore it is the sum of all these parameters that will decide if a type of magnet will be used rather than another in a specific application. Flux Density (B) is a measure of magnetic field strength of the magnet in an ‘open circuit’ condition. The actual flux density measured on the pole face of a magnet will depend on the material, the grade, the relationship of its pole area to its magnetic length and any additional pole pieces that create a further magnetic circuit. Flux density is measured in Gauss, Tesla or mT. Coercive Force (Hc) is the strength of the demagnetizing field needed to reduce the flux density of the magnet to zero. Coercive force is measured in Oersted or kA/m. Maximum Energy Product (BHmax) indicates the peak energy that a magnet can deliver when operating at a working point on the demagnetization curve. Maximum Energy Product is measured in Mega-Gauss-Oersted or kJm³. 2.2 The electrical contact system reed switch or a micro-switch. A certain force is required to actuate the electrical contact device. It can range from a few tenths of grams for systems with reed contacts with a power rating of 10 to 20VA (0.5Amp), to several hundred grams for snap action micro-switches with a 16 or 20Amp electrical rating. In general, the force required to operate an electrical contact increases with its electrical rating, and the power available on the detector depends on the float volume. Most level switches in this catalog use reed switches because they are used for detection level in low voltage and low current electronic circuits. This makes possible to design compact devices. Reed switches are small glass bulbs with a flexible reed strip contact with a breaking capacity of 10 to 50Va, which has the particularity to close in the presence of a magnetic field. These glass bulbs are sealed and filled with argon or under vacuum, therefore they are protected from oxidation. 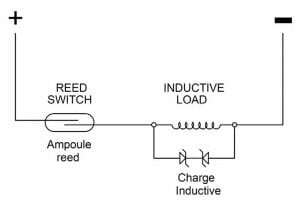 Main models of reed switches used on float level switches maximum switching rating (resistive). Dimensions Mini: L=14.5 mm x 2.2 mm dia. Standard: L=20.5 mm x 2.7 mm max dia. 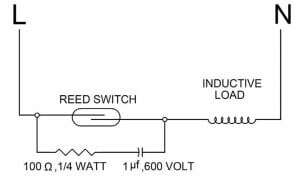 Switching no load or loads where the voltage is less that 5 Volts @ 10 mA or less, the contacts undergo little or no wear and life times in excess of billions of operations are expected. In the 10 Volt range, higher contact wear will take place. Switching 10 Volts @ 10 mA, life times of 50 million to 200 million operations can be expected. gap between them, making a conductive path. This phenomenon is called arcing. Arcing can cause the contacts to burn, weld together or stick. The purpose of protection circuits is to prevent arcing, by shorting this voltage through an alternate path. 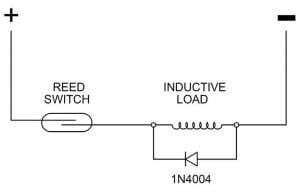 A 1N4004 diode is connected cathode-to-positive .The diode does not conduct when the load is energized, but conducts and shorts out the peak transient generated voltage when the switch opens. A resistor can be added in serial with the diode. A resistor (R) and capacitor (C) are connected in parallel with the switch. The capacitor has high impedance at 50/ 60 hertz, and is essentially a short circuit to high frequencies of generated voltages. On snap action switches, contact opening speed is around 1m per second. The contacts spacing reach the distance to extinguish the arcing in less than 1/1000 sec. Therefore there is no radio interference, and the contact does not deteriorate. Mechanically, this type of contact, also called “ energy storing contact” is much more complicated, expensive, and does not allow such a great control than reed switches. The snap action microswitch is particularly suitable for devices operating at 240 or 400 V and when high electrical rating is required. The contact of a micro-switch wears by micro vaporization at each open and close cycle. This wear is proportional to the strength and duration of the electric arc. The most common contact material is pure or alloyed silver. Its thermal conductivity quickly evacuates the temperature peak occurring during these cycles. Its very good electrical conductivity provides very low contact resistance, usually less than 3 milli-ohms. However it oxidizes and is gradually covered with a thin layer of silver oxide, which is not electrically conductive. This layer is easily vaporized when the switch is used in common household voltages (240V, 300V). However, when used in low voltage (less than 12V) and very low currents (a few milli-amps), and less than 800mW, the contact opening arc is no longer sufficient to vaporize the silver oxide layer. The solution is to plate the contact with a thin layer of gold (said gold flash) 3 to 5 microns thick, to ensure its protection, especially under conditions of high humidity to which are generally subject level switches. For reed switches systems, the most common electrical connection is by wires or cable. Given the low electrical rating of reed switches, conductor cross section is generally less than or equal to 0.5 mm ². If there is no thermal stress or environmental conditions, wires and cables are PVC insulated. Silicone insulation, FEP and Teflon are not recommended because they do not provide hermetic sealing with resin filling and may let in water or moisture inside the product. Tabs or connector outputs are recommended for large quantities. The main requirements of floats are to have a lower density than the liquid in which they must float, to withstand the pressure and temperature of the medium in which they are located, and remain sealed. The vertical float level switches may receive several floats on the same stem, each float actuating an independent switch. All three models can be interchangeable on the same axis. 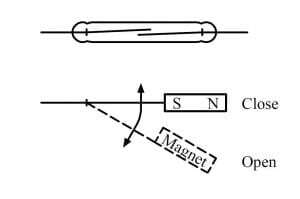 In some vertical models using a reed switch, a wise magnet position in the float can allow to reverse the contact open and close positions by simple reverse of the float. which it can be subjected during normal operation. The maximum pressure limit can vary from 0.05 MPa to 1 MPa depending on the model and thicknesses. Foam floats need to carefully monitor the foam density to achieve constant and reliable buoyancy. The foams are closed-cell type, with a slight skin to prevent the ingress of liquid between foam bubbles. Compared to metal floats, floats plastic have the advantage of better buoyancy and a lower price, but the disadvantage of a lower pressure and temperature resistance. The chemical resistance of plastics varies greatly depending on the materials used. Temperature limits of plastic floats are generally below 85 ° C (Permanent temperature) . It is possible under certain conditions to use materials that offer higher heat resistance (up to 125 ° C or more). The material used must be compatible with the nature of the fluid or liquid with which the float is in contact. In addition, it should not harden or crack over time. Gas or liquid in contact with the float may have a corrosive or destructive short, medium or long term on it, eg ozone, chlorine and its compounds, bromine and its compounds, solvents, hydrocarbons etc. In some applications, when the float is in contact with drinking water, health standards are added, which regulate the chemical composition. The highest standards known, that are used as a normative reference in many countries are those issued by the FDA (Food and Drug Administration, USA) and the WRC (water research council, GB). Stainless steel floats are most appropriate to meet the requirements for drinking water. In the case of plastic floats, these standards provide particularly maximum permissible surface in contact with water and the maximum temperature at which the plastic may be exposed without harmful compounds are released into the water. When the floats are used in waters heavily loaded with calcium salts, it may deposit on the float and the body of the level sensor. 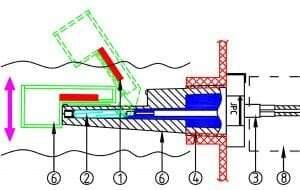 This deposit has two consequences: a heavier float, which can cause it to sunk and reduced dimensional gaps between the float and the body, that may result into a mechanical lock. There is no definitive solution to address these problems. It is possible to delay the lock by using bigger floats (which therefore produce a larger force), and increase the mechanical clearance between the float and the body. Silicone oil based non sticking products can also be sprayed lightly on the parts, but their compatibility with the materials of the float and the body and operating conditions must be carefully checked. Level switches are based on a magnet housed inside the float, so liquids containing magnetic particles such as iron filings must be avoided, because these particles will accumulate on the magnet. – Install an anti-waves shell around the float. This shell is a small box with small holes that will damp the oscillations. The smaller are the holes, the more important is the gap between the liquid level inside and outside the, so one’s must find the right balance between removing waves and rapid control level. The mechanical displacement of the float must be limited to remain within the limits of the magnet position detection by the reed switch. There are on the market float level sensors with clips allowing two select two possible relative positions of the float, a position giving a normally closed contact and one normally open contact. JPC floats are designed for these two positions are possible by simply inverting the float. – Device protection against electric shock, water ingress, pressure value, and chemicals. This body must meet the same requirements as the float, but are added special features due to its electrical protection function. This mounting can be secured by NPT or BSPT (Tapered) threads, or BSPP cylindrical threads or metric threads. Tapered threads require sealing on the threads, and the cylindrical threads require sealing by a flat gasket. In general the vertical flow switches are inserted from the inside of the tank, and secured with an outside nut and gasket, and horizontal flow switches are mounted from the outside of the tank on a female fitting. In large quantities applications of vertical level switches, preference is given to a side bracket, which is better suited for screwdriver assembly. Depending on the application level sensors will be mounted at the bottom, side or top of tanks. Mounting solution design can be adapted to these requirements. – Cover: an optional cover can be attached either by a central tapping or by screws and gasket on the body of the level switch. – Protection against the conditions in which the product will be installed in its application. In most cases, level switches will be integrated by an OEM into a machine or equipment. Then it is this machine or equipment that will ensure protection against water, dust, shock and other contaminants. penetration of water and dust, EN 60529a degree of protection) and an IKxx (Protection against shock, EN 50102).